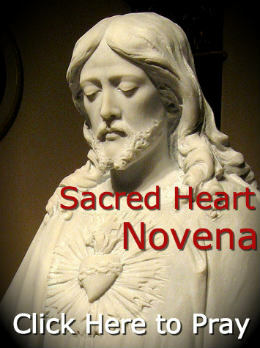 Thank you for joining us in praying the Sacred Heart of Jesus Novena! We hope it was fruitful for you! If any of your prayers were answered while praying this novena with us, please share that below — all for the glory of God! It is always inspiring to hear bout answered prayers & how God is working through these novenas. It is such an incredible reminder of the power of prayer — that God is listening and He is working in our lives! However, for every answered prayer we share, we know there are at least as many unanswered prayers — if not more; and we know that unanswered prayers can be discouraging. But we don’t want you to lose hope, or to stop praying. In fact, many of the Saints that we ask for intercession are great examples that we should persist in our prayers, and keep our faith strong. St. Monica, for example, prayed for nearly two decades before her prayers were completely answered. When my grandfather was very ill, he fell into a stage of mental and physical unresponsivness. He would be laying in the hospital bed unable to speak or move. My siblings and I prayed the novena in a little book which my grandfather gave us. I remember him saying that’s this novena should be prayed in need or suffering. I remember us standing around the bed and praying. I prayed to Jesus to bring my grandfather back so I could say goodbye to him and spend a little more time with him. And I said, your will will be done, I trust in you. About a few days later my grandfather started eating and being himself again. I remember him saying, I am happy I could see you again,I thought I would never see you again. (I flew into Germany to see him when I found out he was sick). I also have to mention that my grandmother passed away a year before my grandfather became ill. They were married for 65 years. Jesus granted me my wish. And one week later my grandfather passed away. When my grandfather passed away, I was grieving a lot. I cried every day. But something inside me told me to start praying the rosary and the novena. I did so. I prayed for month every day. And something changed in me…I was that Christian that would believe in Jesus and go to church on Christmas and Easter. But I only believed. But what really changed was that I found that trust. I completely gave myself to Jesus and trust him with all my heard. Through the death of my grandfather I found Jesus in a way I cannot explain. And now years later I am facing another hardship. My mother was diagnosed with early onset Alzheimer’s. She is only 54 years old. Within two weeks she lost again 15 pounds. She is physically impaired and is very confused. There are time where I am really scared because I don’t want to lose her. Just a week ago I felt if she would die a part of me would die with her as well. In my deepest desperation I began praying the novena and rosary. I feel better now. I putting my trust into Jesus. I am praying to Jesus to find trust in his will and to heal my mom. Please pray the novena for my mom. St. Jude thank you for answering my recent prayers. Oh Lord Jesus, please answer my prayers. The desires you have put in heart and life’s constant needs are what i raise to you this morning. You say that our God knows everything even before we bow down in prayer, i seek your help Oh Lord Jesus. I have witnessed miracles in my life before, l adore you Oh lord. Grant me finances for my business (a lottery win), family and for all that look up to me for financial support. Excellence in my business, getting good employees and business premises and all that i need in the production. Deliverance from alcohol addiction for my sister and brothers and for income generation for all my siblings. I pray that you completely heal mum and give them both (mum&dad) good health and long lives. I pray for our current business and for penetration into the industry and for profitable business, loyal employees and sound machines. I pray for my husband and children, that you continually give them good health and long lives. Keep opening up his thoughts for greater excellence in business. For my children, i pray that they grow under your protection, give them confidence and intelligence. May they grow to know you, love you and serve you all the days of their lives. I pray for their nanny, that you bless her and her family and give her the heart to work. That she stays with us for long. I pray that your will in all this may be done oh God. I love you Jesus, I love you God. Amen! Thank you Sacred Heart of Jesus for answering my Prayers and giving me strength to deal with my illness. Thankyou StJude. My 12 year old daughter was diagnosed with severe scoliosis 3 months ago. Our Spinal Specialist informed us that spinal surgery was her only option. After praying to St Jude for guidance, we went for a second opinion. This specialist stated that she may avoided surgery by wearing a brace, that she has a 50/50 chance that the brace may stop spinal curve progression. My daughter had a follow up X-ray today which confirmed that the brace is correcting her spine. Thankyou StJude for giving us hope that my daughter may recover without the need for surgery. We will continue to pray to St Jude for my daughters on going healing. Thank you Sacred Heart of Jesus for answering my prayers. Glory be to the father as I have seen the love he has for us.